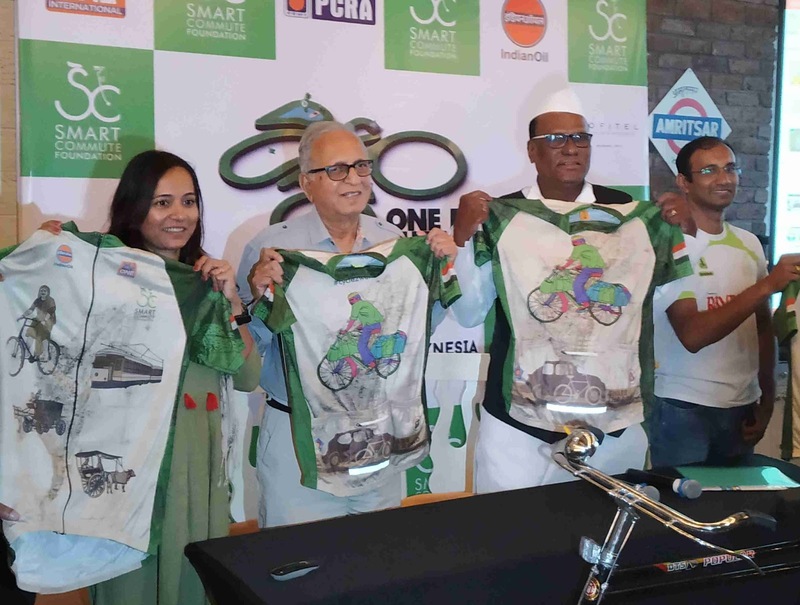 Firoza Suresh, Founder Smart Commute Foundation, Ashok Datar , Founder, Mumbai Environmental Social Network , Raghunath Megde, President Dabbawalla Association, Prashant Keni, Reliance . Mumbai, April 20: Smart Commute Foundation (SCF) has the backing and support from the concerned government, civic and police authorities for their initiatives in promoting cycling among the citizens of the city. Since its inception in 2012, SCF has always been striving hard and initiating various programs with the sole focus of targeting a fit, green, clean, smart and happy city. The Foundation wants to encourage the widespread adoption of cycling as a means of sustainable transportation and as a means of daily commute and as a way of life. In its endeavour to achieve its objectives, the SCF is now all geared up to organise, the One For The World Commute Challenge from World Earth Day to World Environment Day, which is set to kick off from 22nd April 2018 to June 3rd 2018. This was announced by Firoza Suresh, founder of SCF at a press conference on Friday. “We have to create an awareness about Cycling as a means of daily commute. People need to keep a hold of something and let it happen. Who imagined people would wake up at 5 O’clock and start running, but now it’s happening. I am confident that the same can be done with cycling,” Firoza told media persons. “Our goal is to encourage, facilitate, train and organise events/programs that help reduce the carbon footprints and create a ripple effect through having a positive impact on health, wellness, morale, productivity and traffic congestion,” she further stated. SCF feels that if the citizens adopt their plans it would be environmental friendly as it would improve air pollution, aave burning of fuel, reducing traffic congestion, and reduce carbon emissions. The foundation aspire to target over 20% urban India to adopt cycling as a way of life by 2030. It is also keen to impact a shift in new infrastructure priorities towards non-motorised transportation.